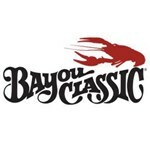 Feed over 300 adults in one sitting with this 30 gallon cast iron jambalaya pot by Bayou Classic. The 30 Gallon Jambalaya Pot by Bayou Classic is a three legged cast iron jambalaya pot used for large sized gatherings or for commercial applications. This jambalaya pot is the perfect jambalaya pot for camp troops. We have had several commercial customers use these jambalaya pots as kettle corn pots or cooking pots in festivals and more. There are no other cast iron jambalaya pots available by any other manufacturer that meet or beat the quality of the Bayou Classic jambalaya pots. The quality of this jambalaya pot is EXCELLENT! This cast iron jambalaya pot does not include the pictured lid. The jambalaya pot lid must be sold separately due to shipping. They must be packed and shipped separately. When you purchase this 30 gallon jambalaya pot, you will also receive the pictured TJ hooks and jambalaya pot stand. Use the jambalaya pot TJ hooks to safely lift and move your jambalaya pot. 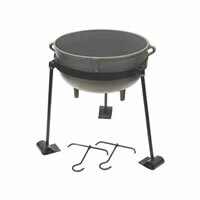 Use the jambalaya pot stand to easily use your jambalaya pot over a campfire or outdoor burner.